CEDAR RAPIDS, Iowa — Quinton Pedroza's pregame dream became a reality Friday night. Cut during training camp last season in Cedar Rapids, the Quad-City Steamwheelers wide receiver stated a wish this week about wanting to show River Kings fans what they have been missing. Pedroza's revenge included six touchdowns — two rushing and four receiving — to lead the Wheelers to a 58-36 victory in front of 1,199 at the U.S. Cellular Center. Q-C quarterback E.J. Hilliard, who arrived along with Pedroza after getting rejected by Cedar Rapids, finished with six scoring strikes of his own, the other two going to Davenport Central grad Keyvan Rudd. 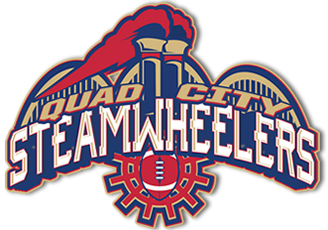 Q-C's first road game since joining Cedar Rapids in the Indoor Football League this fall also was punctuated by a stout defensive effort by the Wheelers (2-1). Cedar Rapids (1-3) managed only 168 yards total offense and suffered four empty offensive possessions — two on long missed field goals and two more via turnovers on downs in the second half. Rock Island native and former Davenport North running back Robert Jones was among the leading playmakers, registering a sack and applying several other pressures from a rush end position. La'Kel Bass and newcomer Jeffery Bradley also had tackles-for-loss for Q-C.
River Kings quarterback Kurt Palandach, one of the league's passing leaders coming into the early-season weekend, finished 8-for-15 passing for 104 yards and 2 TDs. IFL receptions leader Marquel Wade did snare five passes for 83 yards and both scores. However, the Wheelers limited their hosts to 60 yards on 22 rushing attempts and only nine first downs total. Coming off a bye week, following a disappointing home loss to the defending IFL champion Iowa Barnstormers, the Wheelers offense was efficient and lethal while avoiding the penalty problems that plagued them two weekends ago. Q-C rolled up 287 yards total and scored on every possession except its last, when the Wheelers kneeled down to mercifully run out the clock. Only once did the Wheelers settle for a field goal, and that came in the first half, while building a 31-19 lead. Pedroza provided three of those first-half touchdowns, two of them via hook-ups with Hilliard. The Wheelers kept rolling out of intermission, too, scoring on the first possession of the second half, with Pedroza flying over the wall on another of his trademark highlight-reel scoring grabs. Pedroza also struck again on a run before hauling in a 35-yard bomb for his third score of the third quarter, and sixth of the game, for a 51-29 edge. In all, Pedroza posted 105 yards on six receptions, plus rushed for 31 more in gains, as the Wheelers gouged Cedar Rapids for 144 rushing yards on 22 attempts (6.5 per carry). Hilliard was 12-for-19 passing for 147 yards and added 30 more on the ground. The Wheelers visit Sioux Falls next Friday.